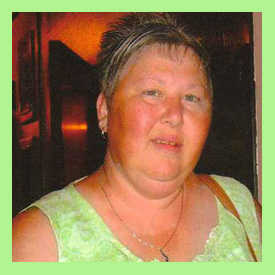 Kathy Smith 47, of Miami, Oklahoma went to be with the Lord June 20, 2011 at her home surrounded by her loving family. She had a long battle with cancer. Kathy was born September 16, 1963 in Oswego, Kansas to Rose (Hoheisel) Schertz and Steven Hurley. She married Farris Smith April 30, 1983 and he survives her of the home. Kathy worked at Don Hume Leather, and was a teacher’s aide at Miami Head Start for 13 years, she was so loved by her friends they all came to visit her and Kathy went home just a few minutes after they had left. Services will be held 10:00 am, Friday, June 24, 2011 at the Cutting Edge Ministries with Monroe Cole officiating. Interment will follow in the McKee Cemetery in Oswego, Kansas under the direction of the Paul Thomas Funeral Home of Miami. The family will receive friends and relatives from 6-8 at the Cutting Edge Ministries Church Thursday, June 23, 2011. Pallbearers will be Phil Lamb, Billy Jack Ferguson, Ronnie Melton, Rick Williams, Matt Brodrick and Jimmy Green. Services are under the direction of the Paul Thomas Funeral of Miami, OK.